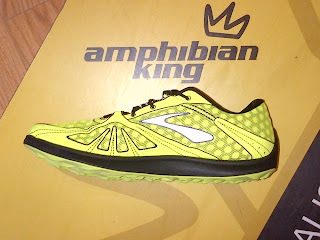 To be honest, I'd forgotten about it so it was a nice bit of a surprise when our +Brooks Running rep Adam arrived into +Amphibian King Galway bearing gifts. He was with us a couple of weeks back and in conversation had promised a pair of Pure Grit for me to try out and to see what I thought of them. PureGrit™, PureFlow™, PureConnect™ and PureCadence™ characterised by the ideal bio mechanic adjustment of each runner, to assure you on your path of feeling the run. This allows an efficient and natural foot strike. 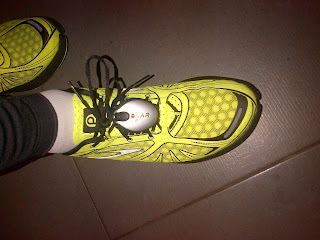 So you are prepared best for new impressions on your tracks and the pure experience of your run. I was excited by the thought of trying these out. Back to the Pure Grit. 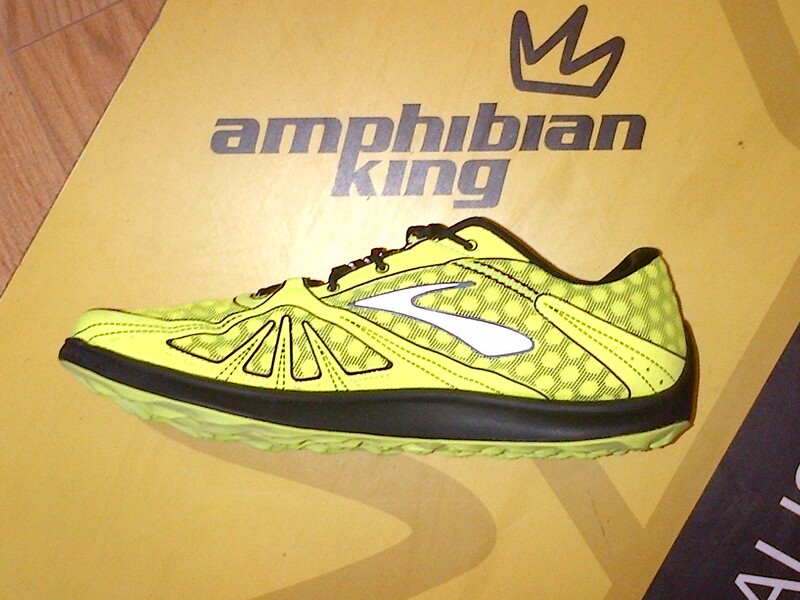 When you want nothing to come between you and the trail, the ultra-light PureGrit won't get in your way. We constructed an outsole with an aggressive, multi-directional lug pattern for better grip on the ever-changing surfaces of adventure. 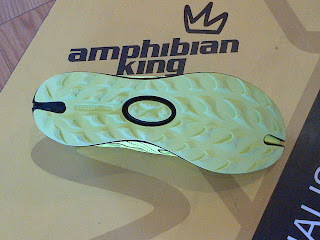 Its concave shape delivers better balance by splaying out upon impact and creating more surface area for ground contact. With blazing colors, you'll light the trail on fire. Metaphorically. Straight out of the box, I liked the look of these. 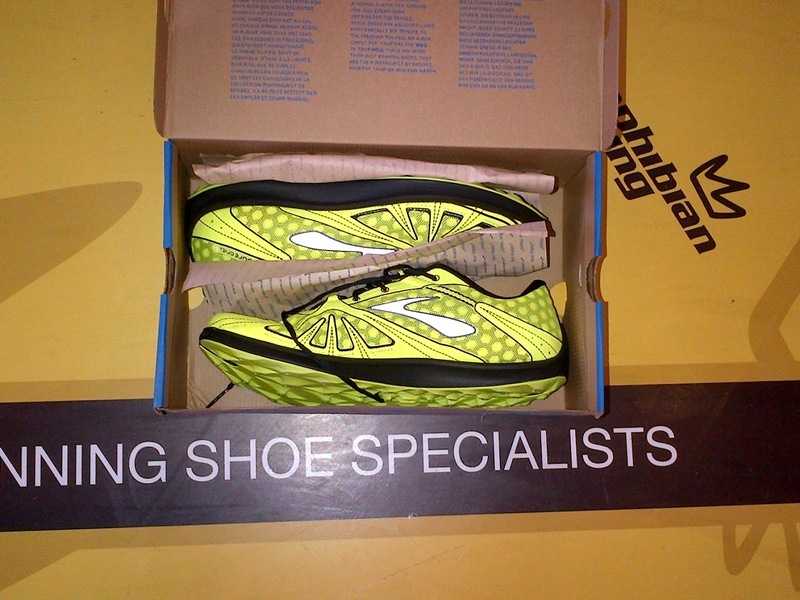 Nice strong colouring, a feature I like in my road shoes, not too sure how practical it is in a trail shoe, we'll see later. Time for a bit of unboxing. Off to a good start there was a pair in the box, left and right shoes present and accounted for. The last (shape) of the Pure Grit is generous. My normal shoes are like this, spacious in the toe box yet snug in the heel area, gripping the heel giving a very secure and comforting feel of stability. The shoes look great too, which is a help, though covered in mud you wouldn't see that. 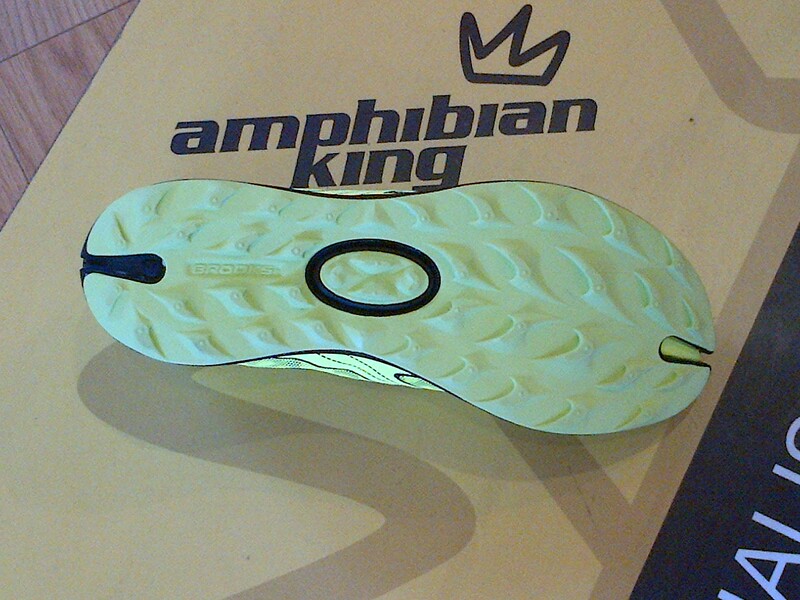 You can see from the styling that the shoe is designed to hug your feet. 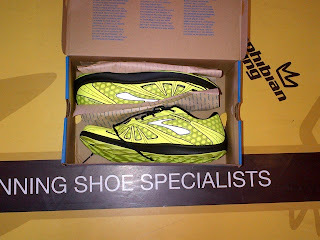 This is a feature of all Brooks shoes which I'm understanding better and better the more I wear them. Its like a journey of discovery, new little things become obvious each time you look at the shoes. The heel cup wraps up and links into the lacing, holding your heel down and back into the shoe, no risk of slippage here! 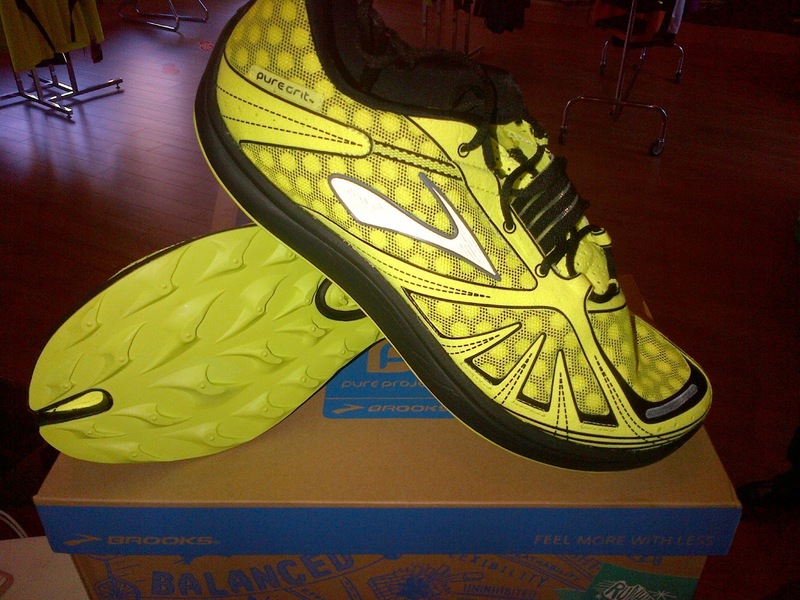 Similarly with the toe box, it is reinforced where needed and supports the sides of the foot without being too snug. I like! 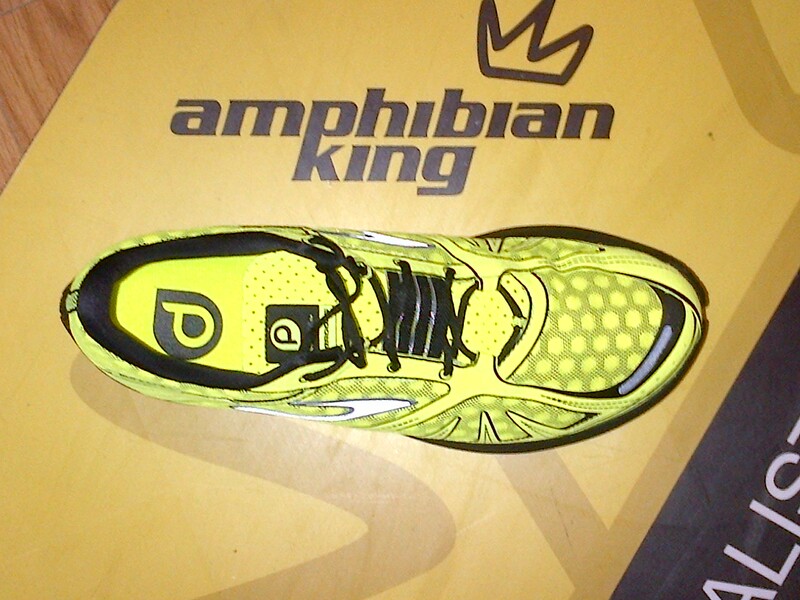 You can see the split toe which helps with flexibility allowing the toes to work independently. The big toe being key to balance, allowing it to work free of the other toes enhances your proprioception & balance. You can see the grippy lugs on the sole. Having them reversed gives optimum grip no matter what you are doing. The rear facing grips to the front, help with going forwards and the front facing lugs at the back help with stopping or running downhill. 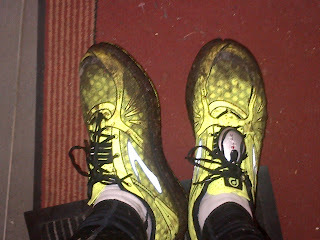 Enough about looking, I wanted to get a run in these puppies so I quickly swapped out my footwear and spent the afternoon wearing the Pure Grit to make sure they suited me and I would have no issues with rubbing or blistering when running. They felt great, nice and stable, flexible on the foot yet secure. They are a real contrast to the Pure Connect which I'm not 100% sure about (for me!). Having worn the Pure Connect regularly I generally find my feet quick tired after them (a sign my feet are working) and there is a very definite roll heel to toe across the shoe which I can tolerate, but not love. Once home, I got geared up for the elements. 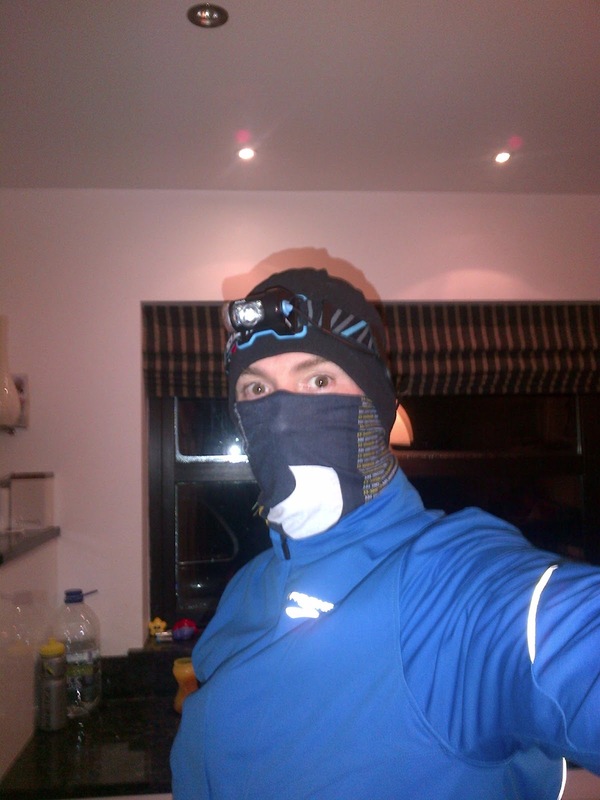 It was sub-zero out so my Brooks Silver Bullet jacket was getting an outing too. As I'd 'misplaced' my Polar G5 pod through a rather unfortunate act of stupidity last weekend I dug out my S3+ stride sensor to give me an account of the run. There is an elasticated comfort band on the Pure Grit which was a perfect spot for attaching the S3+ sensor. The lacing runs under the band which pulls the sides of the shoe in and hugs you around the midfoot. Nice touch, giving extra comfort & security. Out the gate. The roads were lethal!! I have a section of road to run before I get into the woods & trails, roughly 800m long, it was a skating rink. Now I wouldn't expect any shoe to give me grip here so I ran along the verge in the leaf litter and immediately felt the effect of the grippy lugs. I expected a little bit of frosty ground with a bit of a crunch. Instead I got trails that had been churned up by mountain bikes & tractors. They were soft, cut up and muddy!! Now in fairness the trails are maintained by the local MTB club and they rotate through a few locations so as to be gentle on the trails, so no fault of theirs, they may not be back for weeks so no harm done. It did mean an unexpected surface for testing these shoes out though. I wasn't hesitant but I took the first loop handy. I wanted to get a feel for the shoe. You have to trust your trail shoes, if you are going to dig into a turn or let rip on a down hill you have to have faith in the knowledge that the shoe will let you do this with confidence. Sounding out the trails, I haven't been in here in a while, I found parts cut by tractor wheels, unexpectedly I must say, and a quick dunk in freezing water soon had me 'over' keeping my new shoes clean. I was happy to let rip on the areas I knew to be clean where it was just leaf fall and composted forest floor. The shoes dug in nicely and felt extremely secure and comfortable. It may not be to everyone's taste, the broad toe box, but I very quickly forgot about the slight side to side freedom as my feet settled in. Absolutely zero slippage at the heel but the space at the front may upset some people who prefer a snugger fit in their trail shoe. As I say, its doesn't bother me in the least, I feel the more my feet feel relaxed in a shoe, the better they will work . Following the path back around I was much more relaxed and really allowed the shoes to work their magic. Confidently stepping on wet rock the only thing I was wary of were wet roots which will upend you regardless of the shoe you are wearing (except specialist orienteering shoes). Puddles (yep, feet got wet, but no sploshing water in the shoes), mud, hard gravel sections, and good old fashioned forest floor all taken in the stride with no problems. This is a shoe I will buy. 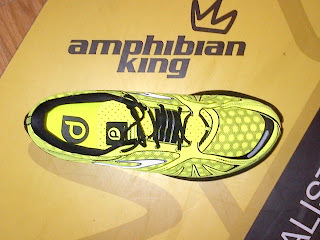 I thoroughly enjoyed running in these, and for sure I will be going again. 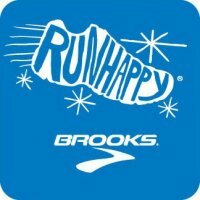 As Brooks say, Run Happy!! My feet were smiling after this one.